Hello from Portland, OR – pretentious foodie capital of the world! Paleo, gluten free, local, grass-fed, heritage, etc. are plastered all over restaurants and food carts. I love it. I’m out here working for a timber investment management organization and building a business plan for mobile slaughter on Boot Ranch. The primary focus of my mobile slaughter project thus far has been focused on economics, land valuations, and spreadsheets. I am currently assessing what it will take for this project to be feasible. I will not bore you with the details – yet. I have also been able to do some cool research since being here. 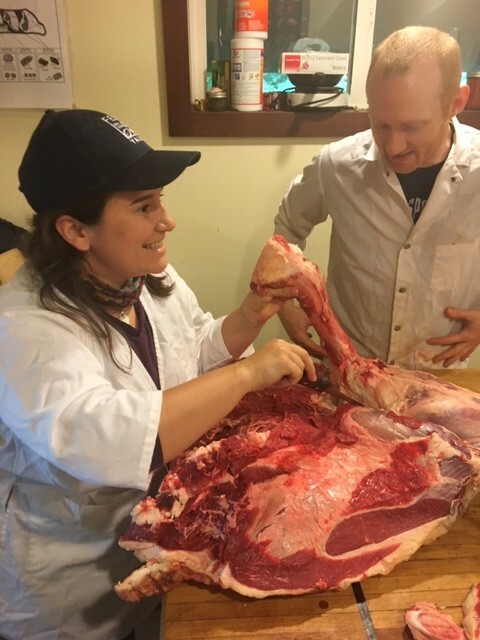 This past weekend I learned how to butcher the most beautiful grass-fed cow! What an experience. 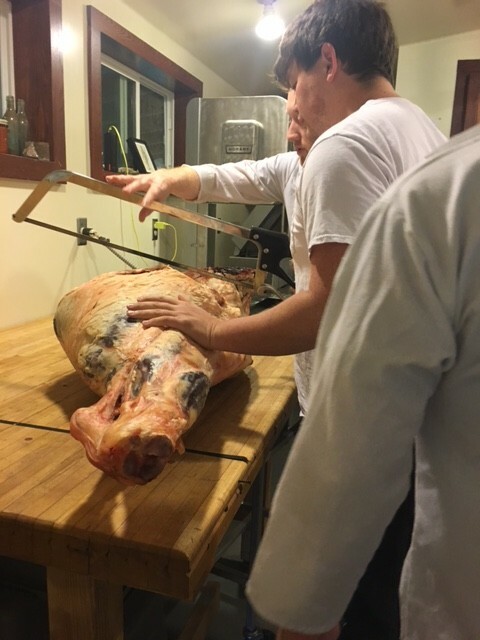 A fellow FES friend, Will Koh, who is working at a local charcuterie company and has experience butchering whole animals, connected with a guy who took us out to a landowner in the countryside to help butcher his animal. The landowner is living off the land – growing vegetables, cows, and chickens for both sustenance and extra revenue. 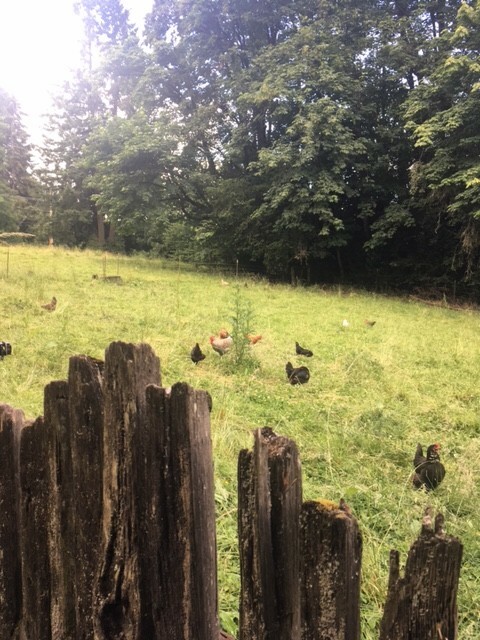 The red-angus cow lived 29 months grazing with the chickens on private land in Scappoose, OR. When arriving at the property we could see exactly where it spent all 29 of those months, never leaving the property and never eating a bite of grain. It spent the last month of its life grazing on mature grass seeds. A small mobile slaughter unit slaughtered the cow in the field, quartered and gutted, then left the quarters to age in a freezer only 50 yds away from the field. The quarters aged for 3 weeks after slaughter and then we weighed them in at a whopping 714 pounds of hanging weight! 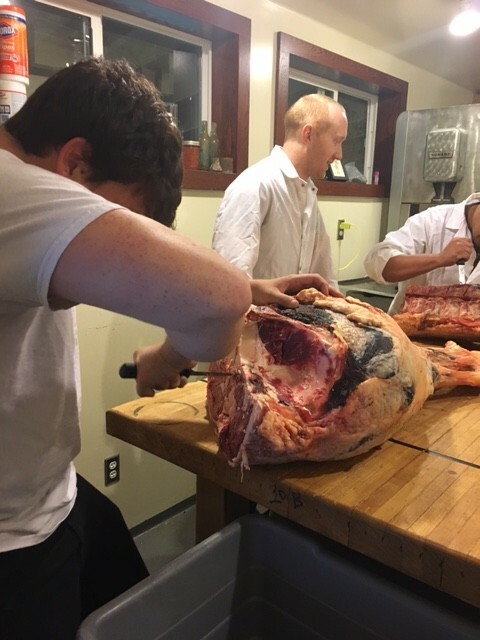 The whole process to break an entire cow into cuts and then package them, took about 6 hours between 3-5 people. I was at the mercy of the best teachers, and even got to use the hand saw on the ribs! I was able to contribute throughout the whole process. It was a very surreal experience. There was a lot of energy in the room. 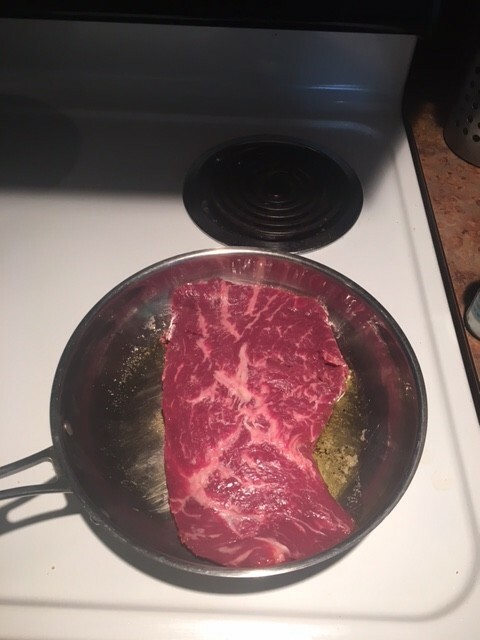 There was no doubt this cow lived a good life – you could see it in the perfectly marbled meat and the 11 .5 pound brisket. I could feel the health as I separated through the cuts. I learned how to distinguish where the cuts are and how to find the perfect line. It is a true art. The body is amazing. Each piece we cut through had a purpose and a function and I got to learn that from the best teachers. I had originally thought this would be good research to understand where each cut comes from and where it could possibly go/what sources would want it. However, I ended up gaining much more than that. I feel that I gained a much deeper appreciation for what goes into my body (which is already pretty deep) and what that truly means when coming from an animal. I feel excited and rejuvenated to share this, and to move forward with this mobile slaughter project. Taking care of what we eat and understanding what goes into our bodies is a lost art. I am thrilled to help ranchers who commit to this mission be successful.